The Sun card represents success, abundance, and radiance. Like the sun itself, it gives strength and vitality to all those that are lucky enough to feel its rays. There is much joy and happiness that is coming to you. Because of your own personal fulfillment, you provide others with inspiration and joy as well. People are drawn to you because they are capable of seeing the warm and beautiful energy which you bring into their lives. You are also in a position in which you are capable of sharing your qualities as well as achievements with other people. You radiate love and affection towards those you care about the most. The card shows that you have a significant sense of deserved confidence right now. The card shows that you have a significant sense of deserved confidence right now. Life is currently particularly good, and the sun is shining your way as you reach the goals that you set. 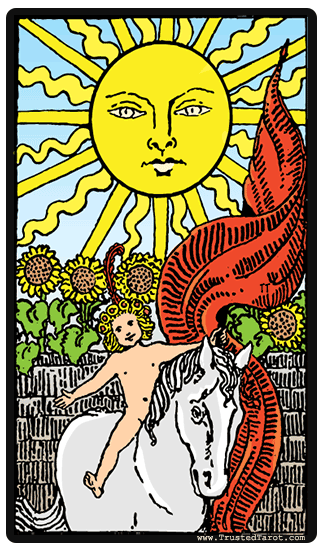 The Sun is one of the cards in the tarot which provide nothing but good feelings and fulfillment. In the reversed position, the Sun indicates that you might have significant difficulties finding positive aspects to certain situations. The clouds might be blocking out the warmth and light that you need to progress. This might be preventing you from feeling confident and powerful. You may experience certain setbacks which are damaging your optimism and enthusiasm. On the other hand, the Sun reversed might be indicative that you are being unrealistic. It might be a sign that you have an overly optimistic perception of certain situations. These are things that you need to take into account in order to ensure that you are on the right track and your successes continue as they do.